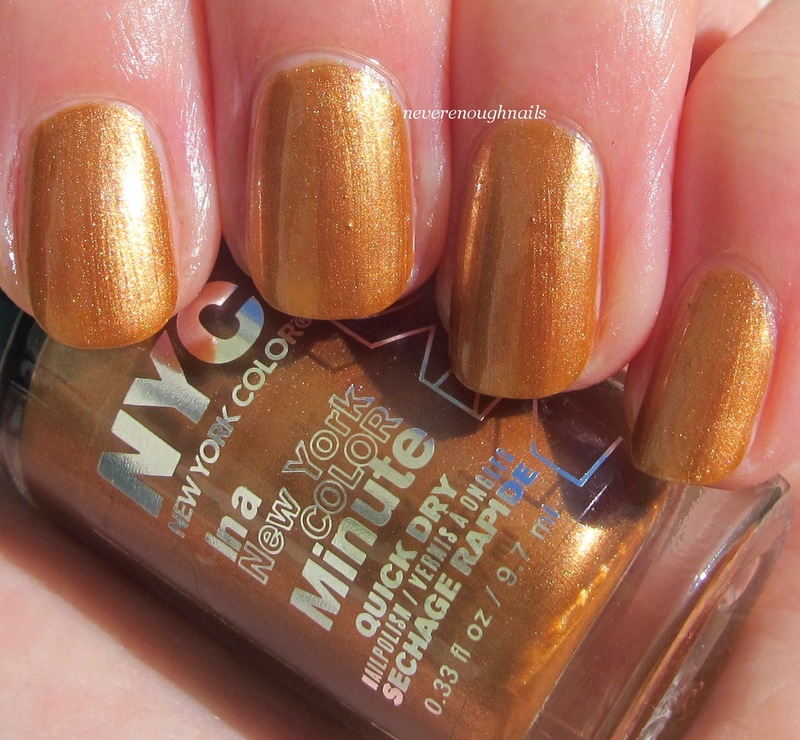 Never Enough Nails: NYC Fashion Queen Collection Fall 2014 Swatches! Now that Halloween is over (boo hiss! ), I have a bunch of awesome fall polishes to show you this week before I move along to holiday goodies. 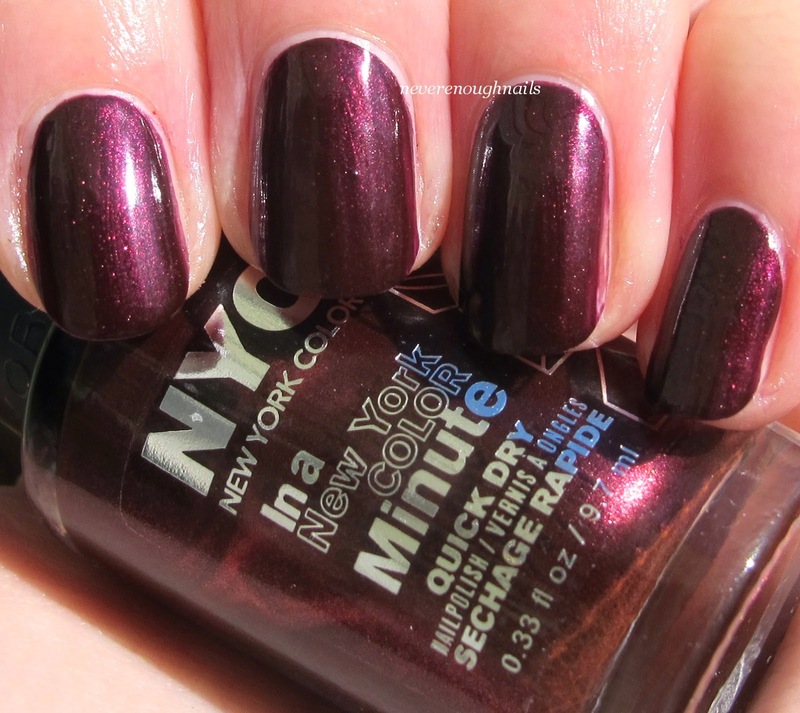 Today I have three great fall gems from the NYC Fashion Queen fall collection. These three will work really well into the holiday season too! The NYC Fashion Queen collection contains 6 glitter "Crystal Couture" topcoats, 3 In A New York Color Minute quick drying polishes and an eye shadow palette. 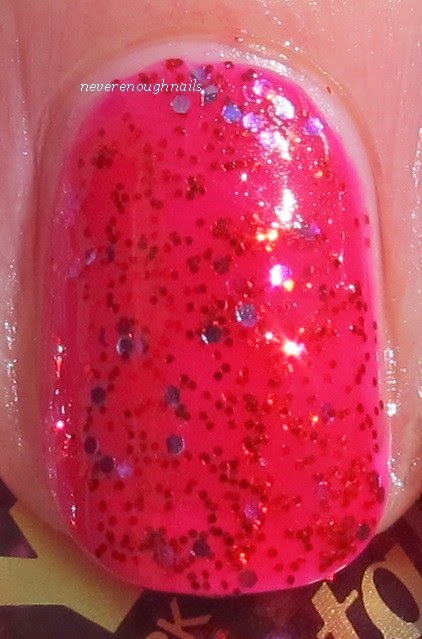 I have two of the quick dry polishes and a Crystal Couture glitter for your viewing enjoyment! 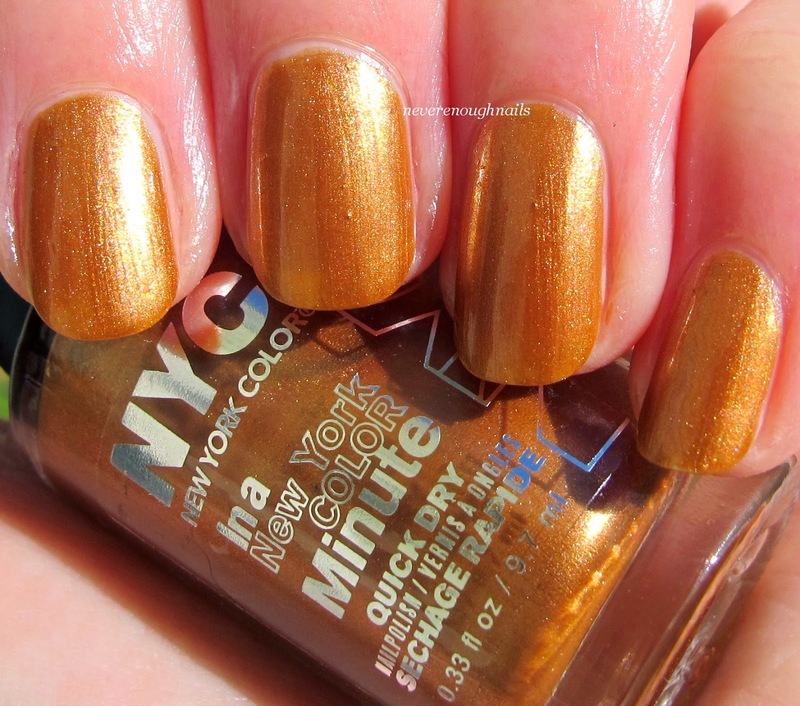 NYC Crown Gold is a pretty coppery golden shimmer. It is a burnished looking gold and has very warm undertones. I love colors like this, it's a lovely mix of gold and copper. Gold and copper tones are some of my favorites to wear in the fall and around the holidays! The formula on all three of these was the same, so I will talk more about that at the end. This is three coats. 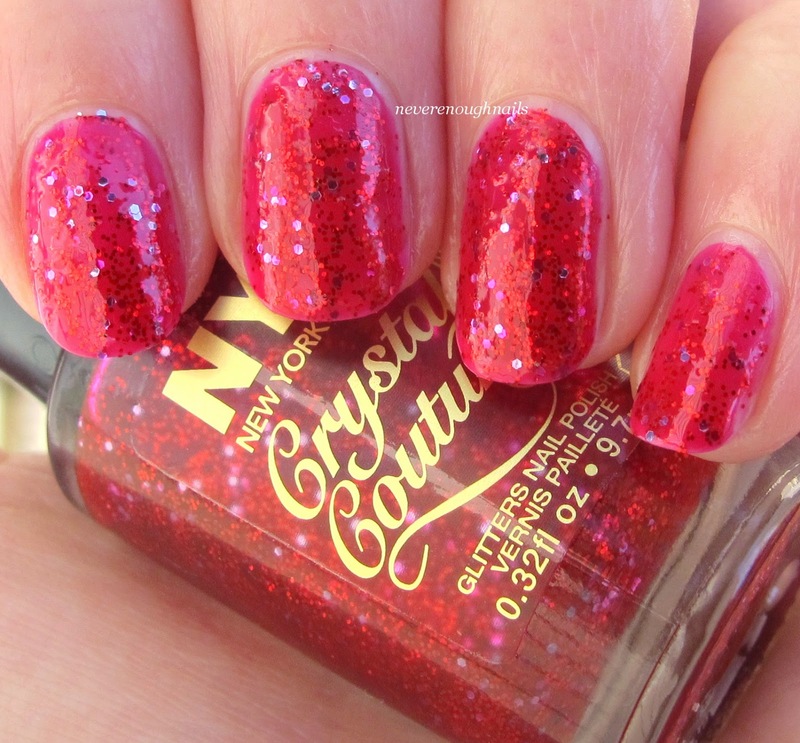 NYC Ruby Queen was a surprise to me, as I thought it was going to be just a glitter topper. I think I thought it was red glitter in a clear base. Ruby Queen is a gorgeous pinky red jelly base filled with small red glitter and slightly larger iridescent glitter. The mix of the red glitter and iridescent glitter is gorgeous and the red jelly base is perfect for showcasing the sparkle. This is really a holiday knockout in person! I will be sporting this a lot in the coming weeks. This is three coats of Ruby Queen alone, no base. I started putting it over Crown Gold to check it out, and that looked really cool too. This is definitely a polish you can wear alone or layer it for awesome looks. 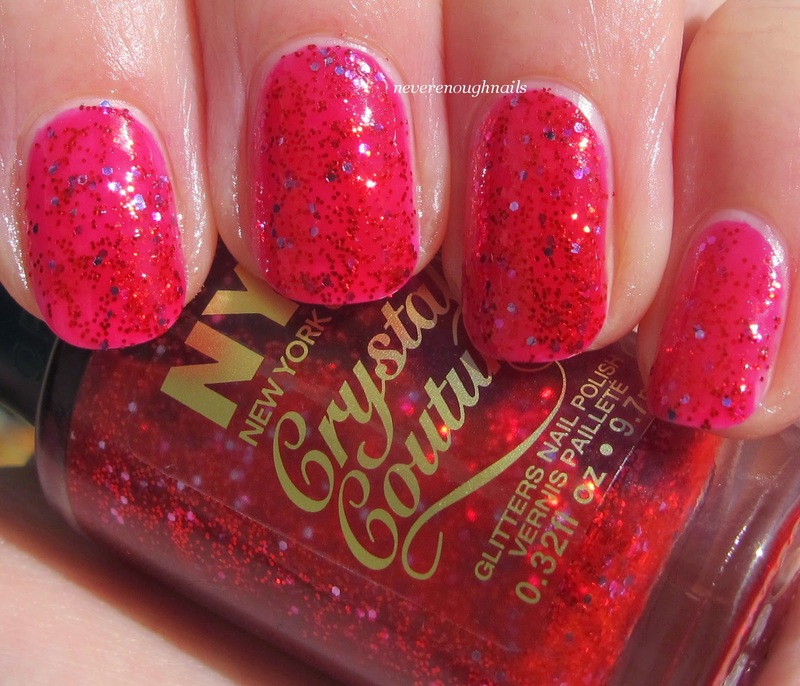 Now that I have tried this NYC Crystal Couture polish, I want to get some of the others! There is a gorgeous looking green called Queen's Jewels that I am going to hunt down for sure. 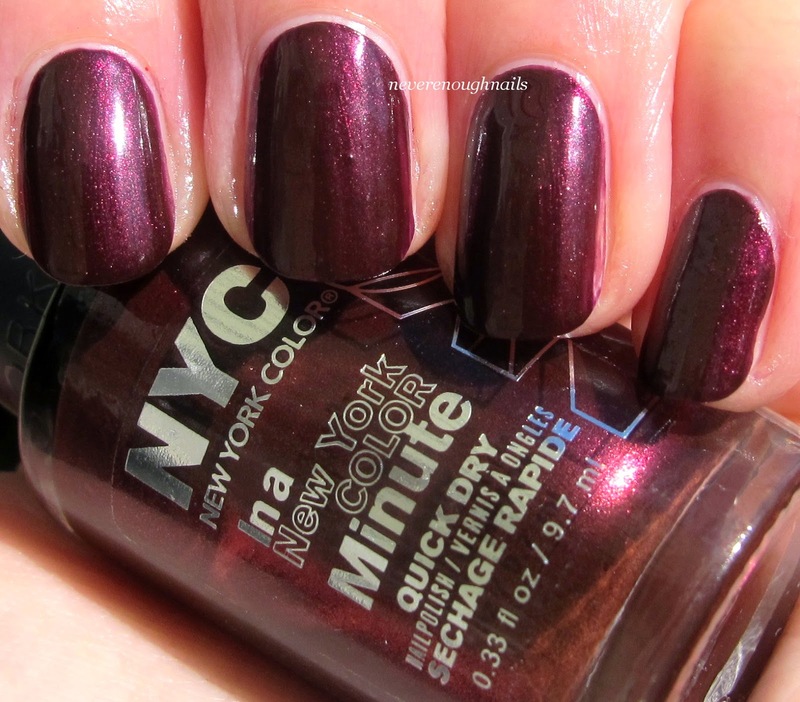 NYC Queen of the City is a pretty vampy purple-red shimmer. 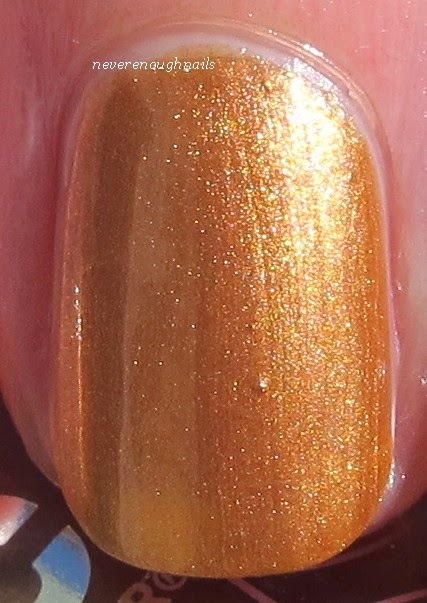 Queen of the City is a fall classic shimmery wine color. I have tons of these vampy red wine shimmers, but I do love them all. It's hard to go wrong with this shade in the fall and winter. This was three thin coats. It most likely should have just taken two, but I did a much thinner second coat than I meant to (not paying attention! ), and just felt like it needed the extra pop of a third. As for the formula of all three of these, it was really nice. These all had that gel-like feel to them, I love that consistency. It stays right where you put it and lets you really have a lot of control over application. I did not have to do clean-up on these swatches, except for my ring nail in the pictures of Queen of the City. Binx jumped on the table while I was doing that one, so I had polish all over the side of my finger LOL. All three polishes also dried really quickly, yay! I used one layer of Sally Hansen Insta Dri Top Coat on top to add a bit more shine. I recommend looking around for the NYC Fashion Queen collection. The two shimmers I tried had excellent formulas and are perfect fall and holiday colors. The Crystal Couture glitter is amazing and I myself am going to find this collection in a drugstore to buy a few more of those Crystal Coutures! Find yours at chain drugstores and mass merchandisers nationwide. To find a retailer near you, please visit www.newyorkcolor.com. Me too Ananka! I am impressed with NYC polishes lately!